The UGEC IPO is hosted by the Julie Ann Wrigley Global Institute of Sustainability at Arizona State University. Corrie has been with the Urbanization and Global Environmental Change (UGEC) Project since May 2009. As Executive Officer she develops and leads a diverse portfolio of research and outreach activities, and manages the International Project Office (IPO) at Arizona State University in Tempe, Arizona. She has a Master’s degree in Political Science with a focus in environmental policy. Prior to her engagement with UGEC she worked for a local grassroots non-profit organization that engaged closely with the public and also city- and county-level government to promote issues of environmental concern and sustainability. She is interested in finding innovative ways to reduce the gap between science and policy and in particular, making urbanization and global environmental change research more policy relevant. Corrie is looking forward to leading the UGEC project throughout its third phase, which will be characterized by synthesis research and activities, and also working to successfully transition the project alongside the new global research initiative ‘Future Earth’. She is an avid hiker of mountains and has most recently taken an interest in the culinary arts, i.e., just learning how to be a better cook. 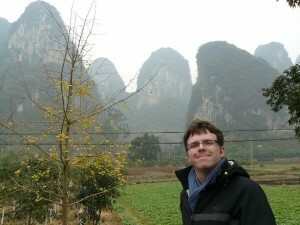 Mark has been Project Coordinator for the Urbanization and Global Environmental Change Project since August 2013. He received his M.S. in Urban and Regional Planning with a certificate in Energy Analysis and Policy from University of Wisconsin-Madison. Before joining UGEC, he worked with rural communities and non-profits organizations on issues of renewable energy implementation and sustainability. Mark is also a trained teacher, with a background in ESL and Montessori. When he isn’t working, he enjoys reading, listening to music and spending time with his wife and daughter.